Ealing Council’s apprentices celebrated the end of their two-year placements at the council at the annual awards and graduation ceremony on Wednesday 4 August 2010. The event recognises the success of apprentices who have achieved Level 2 and Level 3 NVQ qualifications, while participating in the council’s apprenticeship scheme. The scheme gives young people the chance to gain valuable work experience at the council and the possibility of a job at the end of it. 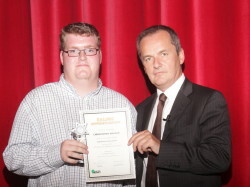 Chris Walker, catering apprentice, received the Significant Achievement Award. Chris, who has learning difficulties, started as a volunteer in the kitchen at Learning Curve and ended up being in charge in the kitchen and teaching the other volunteers how to cook. 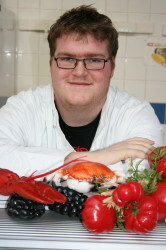 Chris said: “I have really enjoyed working in the kitchen and learning new skills. If I hadn’t been an apprentice, I would probably be on benefits as it would have been hard for me to get a job doing what I wanted because of my learning disability. Awards were also presented to Sanjay Chana, strategic procurement apprentice who won Apprentice of the Year and Mary Guruparan, insurance officer, who won Supervisor of the Year. Councillor Julian Bell, Leader of the Council, said: “Congratulations to all the apprentices who are graduating this year. Completing the scheme is a significant achievement and I am pleased that five of the graduates have been able to secure positions with the council following their placements. More than 70 apprentices have been recruited onto the scheme to date, with 40 having completed the programme. Seven of the 20 new apprentices for this year will begin their placements in September. The scheme is for young people aged 16-24 years old, who live or go to school or college in Ealing. Successful candidates also work towards gaining NVQ level 2 and level 3 training in Business Administration, Information Technology, Customer Services or other skills areas, during the two-year programme. The council will begin recruiting for the March intake this autumn. More information about Ealing Apprenticeships is available from the council’s website www.ealing.gov.uk.